On the Lake View Avenue, Cambridge, stands a pretty two-story French-roofed house. It is painted white, with green blinds, and has a neatly kept lawn in front. Several rose bushes twine about the portico leading to the front door, and a number of shrubs grace the lawn. The house is owned and occupied by Samuel P. Davis of Watertown, a wealthy dealer in beer. Mr. Davis is the father of Mrs. Etta G. Carlton, the unfortunate woman who was brutally murdered last March in her own house in Norwood Park, about a mile and one-half distant. The spot is a beautiful one in summer, but in winter, with the shrill wind whistling through the pine trees hard by, it is a desolate part of Cambridge’s suburbs. Mr. Davis’ family consists of himself, wife, sons, and a domestic. He also has the two children of his murdered daughter to care for. Quite frequently he received a visit from another daughter residing in New York, accompanied by her husband. 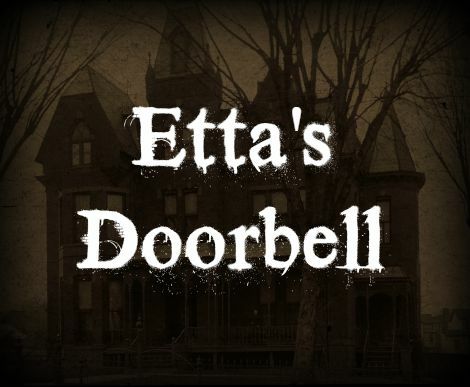 During the closing summer months the neighbors at frequent intervals have been called into the house by the Davis family, to investigate a mysterious ringing of the front door bell. That first manifestation occurred during the latter part of August. The family were in the sitting room when the bell rang. The call was answered, but when the front door was opened no one was there, and nobody was to be seen on the street. Thinking perhaps a mistake had been made the back door was opened, but it was found that the bell there had not been used. It was thought that some boy in the neighborhood had pulled the bell in a spirit of boyish mischief and had run away to a hiding place to enjoy the amazement of the person who might come to the door. No further thought was given to the matter. A few minutes later the bell again rang, and no one was found at the door. A watch was immediately set upon the pathway to the front steps and portico, to catch the cause of the mischief, but the bell rang several times without the slightest sign of any one approaching the house. The family became somewhat alarmed and set about an investigation. 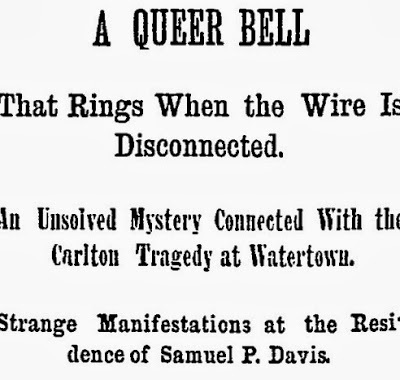 The bell wire was carefully followed up, but it did not appear to meet with any obstruction, and after a search of several hours Mr. Davis was forced to acknowledge himself at a loss for an explanation of the peculiar ringing. Neither Mr. Davis nor his wife has the slightest belief in so-called spirit manifestations. The bell immediately rang three times. The next day Mr. Davis, with an exceeding troubled mind, called upon Captain Cloyes at Police Division 1 and stated the facts to him. Captain Cloyes immediately paid a visit to the house and made a careful examination of everything. It was found that the bell wire passed down the inside casing of the front door, then through the floor to the cellar. Here it was passed along a heavy joust to the rear of the cellar, then up through the floor into the entry again. It ran up the kitchen wall to within a few inches of the ceiling, and then turning to the right for a few feet was attached to the bell, almost over the kitchen door. The bell itself hung from a spiral or coil and the spiral was securely bolted to a heavy timber. The bell wire was perfectly free and unobstructed. There was no settling of the house to cause vibration when walking about. A run in the front entry and in the room directly over the bell caused not the slightest motion of the bell. The front door was opened and then violently closed, the walls were hammered and the foundations examined, but without success. Captain Cloyes remained several hours, during which he disconnected the bell. No ringing was heard, although just before the official called the bell had rung. Captain Cloyes detailed upon the case Officer Hixon who is deemed one of the best on the Cambridge force. He passed nearly an entire afternoon in the house, but could discover nothing wrong. Late in the afternoon he disconnected the wire and started for home. He left orders that if the bell should ring, he be sent for at once. His home is on Lake Avenue, a few minutes walk from the residence of Mr. Davis. He had hardly entered his door before word came that the bell was ringing, and he rushed back to the house. Placing himself in the entry he waited. In a few moments the bell began to ring with a steady vibration. The tone was clear and distinct, though very low. There could be no mistake about it. In perhaps forty-five seconds it stopped. The officer laughed at the thought of anything supernatural, but is greatly perplexed to account for the phenomena. Hiram Hollis, Mr. Davis’ son-in-law, is a cool-headed business man from New York. He visits his father-in-law quite frequently, coming in from New York on Saturday night and passing Sunday at Cambridge. He also endeavored to trace out the mystery, but failed. He is positive in his declaration that the bell had rung while he was gazing at it. Mrs. Davis, accompanied by her daughter, Mrs. Hollis, visited Boston and called upon a spiritualistic medium, but became satisfied that the medium could give no information. They visited another and were told that it was the spirit of the deceased Mrs. Carlton who was ringing the bell; that they should not be greatly alarmed, as no harm could come to them. She further referred to the murder of Mrs. Carlton, and located the wounds on the temple, and on the back of the head and body, and told, so it is said, other details of the terrible affair with marked truthfulness. During the bell-ringing manifestations, a number of the neighbors were called in and witnessed the peculiar antics of the bell with their own eyes. Mr. Davis will say but little of the matter and refuses to enter into conversation on the subject. Since September the bell has not rung, but the mystery is still unsolved. The entire community were startled on Monday morning, as they took up their papers, to learn that a terrible and mysterious murder had been perpetrated in Watertown. The details of the murder, which are shocking to relate, have probably by this time been read by everybody. Suspicion strongly points to the husband having knowledge of the author but no proof has yet been found, insufficient to warrant an arrest. A reward of $500 is offered by the town for the capture of the murderer, and $3000 by the relatives. The funeral of Mrs. Carlton, the victim, took place from the home of her father, Mr. Samuel Davis, on Lake View Avenue, Cambridge, Wednesday afternoon. The services, which were attended only by the relatives and immediate friends of the family, were conducted by Rev. O. F. Safford, of the First Universalist Church of Cambridgeport, who offered prayer, and then spoke of the consternation at this event and the mystery connected with it. He pictured the deceased as a mother and a wife, and spoke of God's providence and justice that will in the end find out the evil doer, who, if he does not confess, yet cannot escape. The character of the deceased was referred to as being pure and spotless, and God's mercy was invoked for the two little children left motherless. Appropriate musical selections were rendered by the choir of the Universalist Church at Allstown of the Sunday-school of which Mrs. Carlton was a member. The remains, which were only exposed to the view of relatives, were in a well-preserved state and were enclosed in a casket of white broadcloth, upon the cover of which was a silver plate bearing the inscription, 'Mrs. Etta G. Carlton, died March 18, 1883, aged 30 years.' The floral offerings were tasteful and elegant. The interment was at Evergreen Cemetery, Brighton. The genteel lady was well known in Cambridgeport, residing before her marriage at the corner of Clinton and Harvard streets. The affair is the most inexplicable of anything of the kind occurring in this vicinity for many years. The crime was committed with a large cobble stone to the back of Etta's head. From what I gathered from other accounts, several residents and the police suspected that her husband, who was “not regarded with respect,” killed her for her $5000 life insurance policy, and several other shifty characters were briefly arrested in connection with the crime. Her murder, like the puzzling behavior of her family's door bell, was never solved.